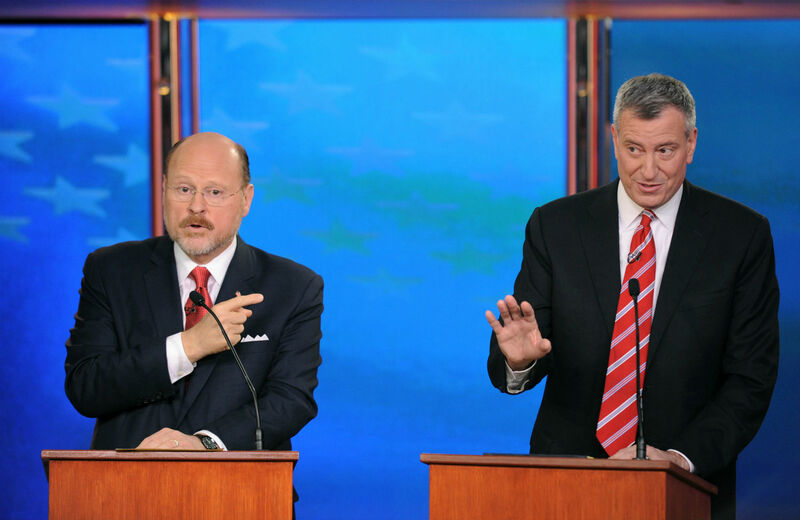 Lhota’s sincerity shone through in the final NYC mayoral debate, but he’s no match for de Blasio’s political savvy. The ad fails to convey sincerity (in it he repeats his not-credible line that “we are one bad mayor away from unsafe streets, failing schools and fiscal chaos”)—but in the debate last night, he was sincerity central. In fact, despite some of Lhota’s short-sighted policies and an apparent blindness to the folly of, say, trickle-down economics, I found myself liking the guy. I’m a chump for underdogs, especially when they’re halfway out the door, but last night Lhota showed heart and concern—on racial profiling (“There’s no room for racial profiling in New York,” Lhota said emphatically. “If a store [like Barneys] racially profiles, that store should be punished”), for the homeless (treat them like “humans,” he said, but only shelter the New Yorkers among them), and for the unrelentingly hard work of “union members” during Hurricane Sandy. Lhota evinces empathy, at least as much as progressive de Blasio, but not quite enough to follow through with helpful or even logical policies (how, for instance, do you ascertain the residency of homeless people? ), and not enough to overcome an inability to see the problems obvious to most everyone else. Was Rudy Giuliani, the mayor for whom Lhota served as a capable deputy, “divisive,” as de Blasio charged, and as most New Yorkers saw firsthand? Not to Lhota. “The divisiveness,” he said, “was minute compared to” all the good things he did. Lhota couldn’t even see how his boss was divisive in the Patrick Dorismond case. After Dorismond was killed in a police shooting, Giuliani released his sealed juvenile records in order to prove he was “no altar boy.” “I don’t think that was divisive,” Lhota said last night. “The fact that Mr. Lhotoa doesn’t even see that is divisive” is the problem in a nutshell, de Blasio replied. That’s the problem with a lot of moderate Republicans, like Representative Tom Cole of Oklahoma or former Senator John Danforth of Missouri: their hearts often are in the right place, but they refuse to connect that to policy. But I got to say, another reason Lhota began to grow on me during this race is that he isn’t slick, and in fact is less so than de Blasio. Lhota is an experienced manager, and maybe he’d be good at running the city’s bureaucracy of 300,000 workers, as the New York Times portrays him today. But Lhota, who hadn’t run for public office before this race, is a lousy politician. He doesn’t sell himself—on the one-year anniversary of Hurricane Sandy, he didn’t mention that as MTA chief, he restored subway service when so many other services faltered (“I’m not going to use this as a day to politic,” he said), and he barely mentioned the MTA in the debate the next day. Being mayor is as much as a politician’s job as is getting the trains to run on time, and time after time, de Blasio’s showed he’s an experienced politician. In fact, in two profiles of de Blasio, he’s coming across as a minor master of long-game, three-dimensional chess. The Times writes today that on when he served on the city council, de Blasio “Blended Idealism With Push for Power,” and that he “showed a zest for taking care of, and taking up the causes of, those important to him,” including his mother and his dentist as well as constituents and the larger progressive community. It looks like we got that guy. Read Leslie Savan's take on the second NYC mayoral race.